Washington DC, February 7, 2019 — Rising Democratic star Rep. Alexandria Ocasio-Cortez and Democratic Senator Ed Markey on Thursday laid out the goals of a Green New Deal to achieve net-zero greenhouse gas emissions in 10 years, setting a high bar for Democrats who plan to make climate change a central issue in the 2020 presidential race. The resolution is the first formal attempt by lawmakers to define the scale of legislation to create large-scale government-led investments in clean energy and infrastructure to transform the U.S. economy. “The Green New Deal fully tackles the existential threat posed by climate change by presenting a comprehensive, 10-year plan that is as big as the problem it hopes to solve while creating a new era of shared prosperity,” according to a summary of the resolution released by the lawmakers on Thursday. Republicans have already criticized the initiative, waving off any kind of proposal as heavy-handed. The Trump administration does not believe action on climate change is necessary and is focused on increasing production of oil, gas and coal on federal and private land. The non-binding resolution outlines several goals for the United States to meet in 10 years, including meeting 100 percent of power demand from zero-emissions energy sources. It also calls for new projects to modernize U.S. transportation infrastructure, de-carbonize the manufacturing and agricultural sectors, make buildings and homes more energy efficient and increase land preservation. The Green New Deal also aims to create an economic safety net for “frontline” communities that will be affected by a radical shift away from fossil fuel use. “We … need to be sure that workers currently employed in fossil fuel industries have higher-wage and better jobs available to them to be able to make this transition, and a federal jobs guarantee ensures that no worker is left behind,” according to a summary of the plan. 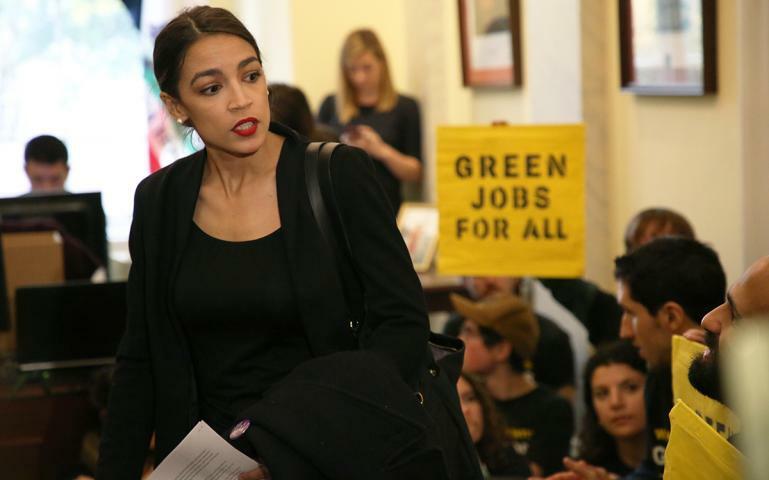 The Green New Deal was put into the media spotlight by a youth coalition called the Sunrise Movement and Ocasio-Cortez, 29, the youngest woman to serve in Congress. Markey, a veteran lawmaker from Massachusetts, introduced sweeping climate change legislation a decade ago, which passed in the House but stopped short in the Senate. © Georgia Asian Times. All Rights Reserved.